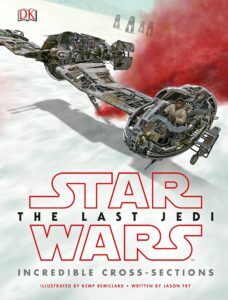 With any Star Wars movie, there are many ships and, as we have benefited from the publication of cross-section books about recent Star Wars movies of vehicles, The Last Jedi is no different. 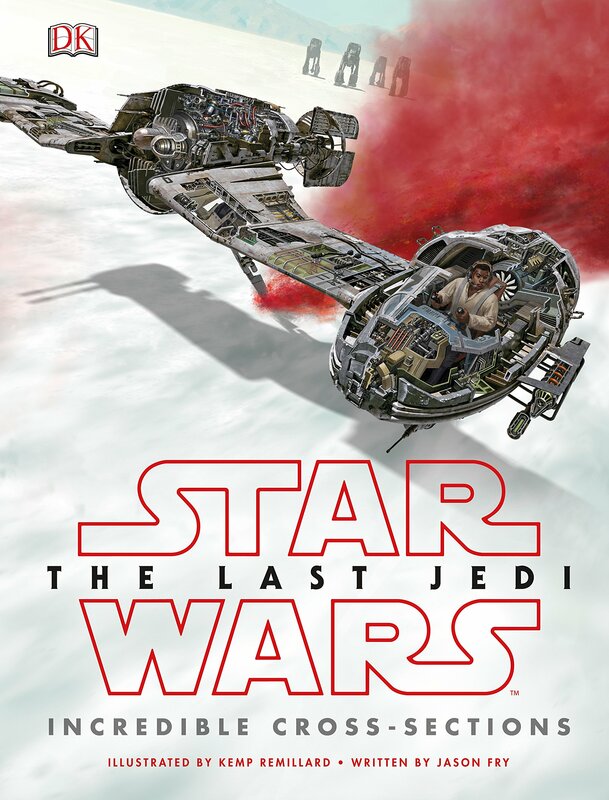 Star Wars: The Last Jedi Cross-Sections is a wonderful resource for those curious about the vehicles in The Last Jedi. When I began reading such Star Wars cross-section books a couple years ago, including for The Force Awakens (which I discussed on Skywalking Through Neverland), it seemed like a genre that was too detailed. Who needed these details about these ships, especially those that point out various random details of the vessels? While I still am uninterested in most of the small details about these vehicles, such books are still of interest for three reasons: 1) even if I am uninterested in such details, there are some fans out there who are quite interested and, I would imagine, pleased that they are included, 2) some of the tiny details actually can be interesting, and 3) there is a lot of information that is quite fascinating in these books beyond the tiny details. 1 – The Supremacy is a massive, massive ship. Okay, anyone watching The Last Jedi cannot miss how massive a ship it is. Just how massive a ship is it? To provide a sense of just how big it is: “The Supremacy is able to dock eight Star Destroyers at once – six externally and two internally” (20). 4 – I found the AT-HH to be really fascinating. 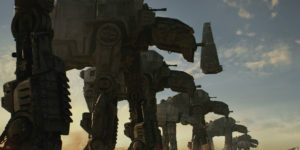 It stands for All Terrain Heavy Hauler, and is the bulky tug walker, of which we see two pulling along the superlaser siege cannon on Crait. “The AT-HH borrows a strategy from the insect world: more legs means greater stability. The tug walker has three rows of legs; the front row holds 11 legs, while the rear two rows each have 10. The legs can rotate around their attachment points and be repositioned within the rows” (34). 7 – Kylo Ren’s ship, the TIE Silencer, is unique to him, since it’s merely a prototype (25). 8 – Why were the bombers at the beginning of The Last Jedi not in The Force Awakens? Apparently, it was due to another mission: “A mercy mission to Attera by D’qar’s Cobalt and Crimson squadrons left the bombers unavailable for the assault on Starkiller Base, but the squadrons’ survivors arrive in time to play a pivotal role in defending D’qar from the First Order’s assault” (12). 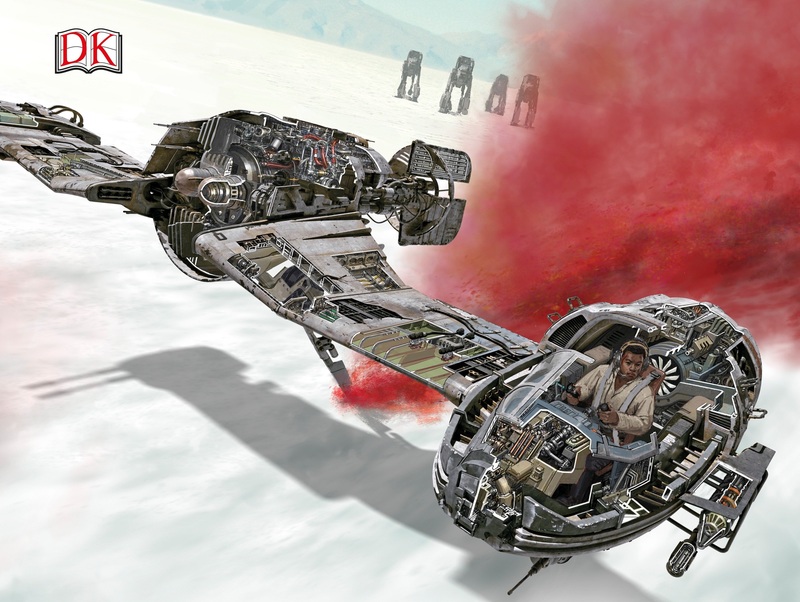 10 – There is a really amusing background description of the history of the ski speeders on Crait – according to this book, “the early Empire witnessed a fad for asteroid slalom” (42), and these ski speeders were initially created for these races. There are two paragraphs dedicated to this development, which is fairly amusing, since it really doesn’t affect the story of the movie. Nevertheless, it is a clearly creative background story(!). Also, for those wondering, “The ventral mono-ski stabilizes the speeder, ensuring its powerful engine supplies thrust and not lift” (43). There are many more tidbits of fascinating and insightful information in Star Wars: The Last Jedi Cross-Sections – it’s worth checking out.